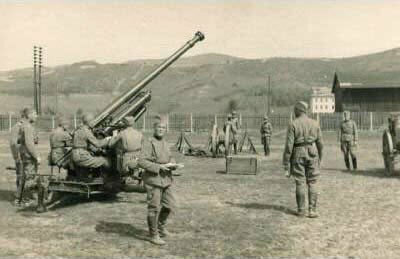 Yugoslav artillery regiments were mainly equipped with Czech (Skoda) and French (Schneider) built weapons. Infantry division contained 75mm and 80mm light field guns plus 100mm light howitzers. Mountain divisions had light 75mm mountain guns and 100mm mountain howitzers. Army units were issued with heavy regiments and these contained 105mm guns, 150mm howitzers. Some elite artillery units were motorised and contained the more modern medium and heavy guns and howitzers. Skoda was also responsible for supplying most of the anti-aircraft guns and all of the anti-tank guns.